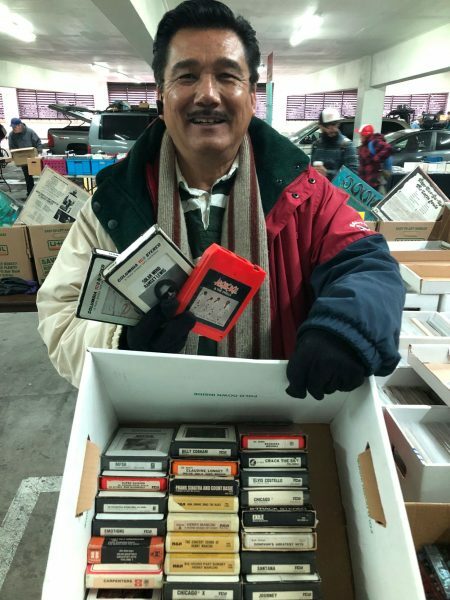 8-Trackin’: Cart Shopping In Los Angeles! CART SHOPPING IN LOS ANGELES! 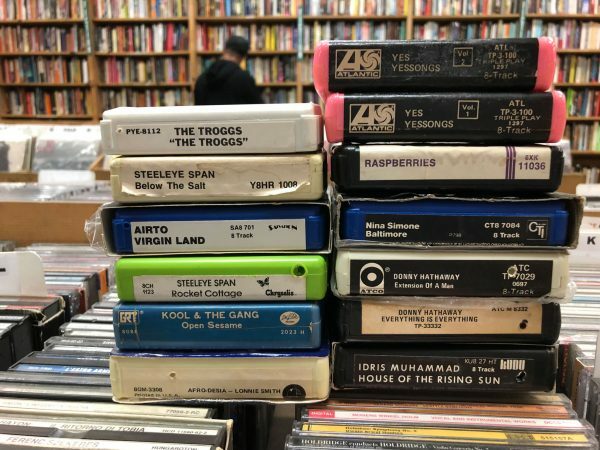 During a family trip to LA last weekend, I sneaked out to a few stores in search of 8-tracks. 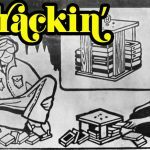 Here’s what I found! 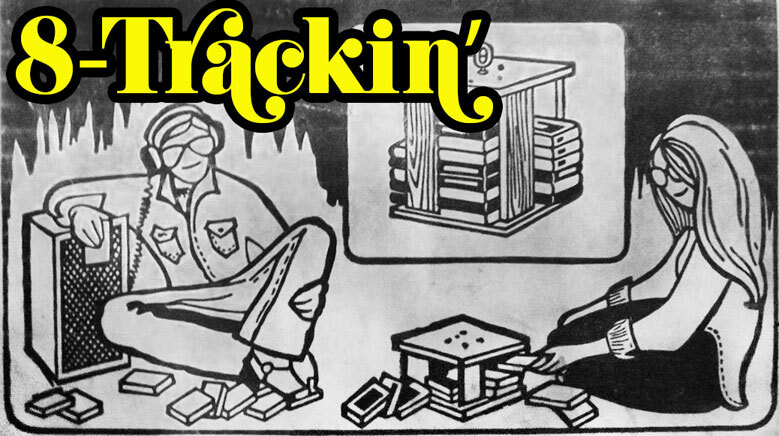 Seven boxes of killer tapes — and one dude digging through them. Guess I’m not the only 8-track fan in LA right now! 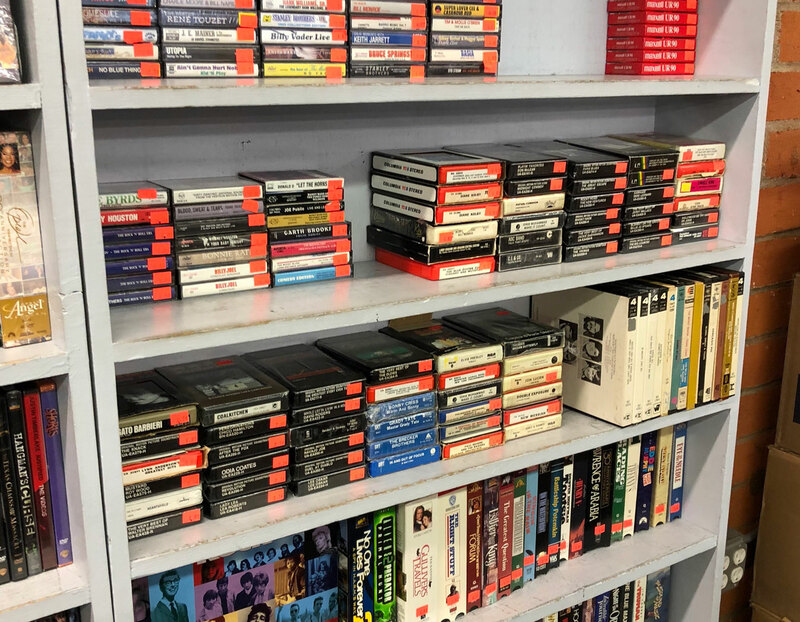 Each box held a mix of loose, lower-priced tapes ($5 and under) alongside higher-value ones ($8-25) in theft-proof plastic “trappers.” I wound up grabbing about fifteen carts total. 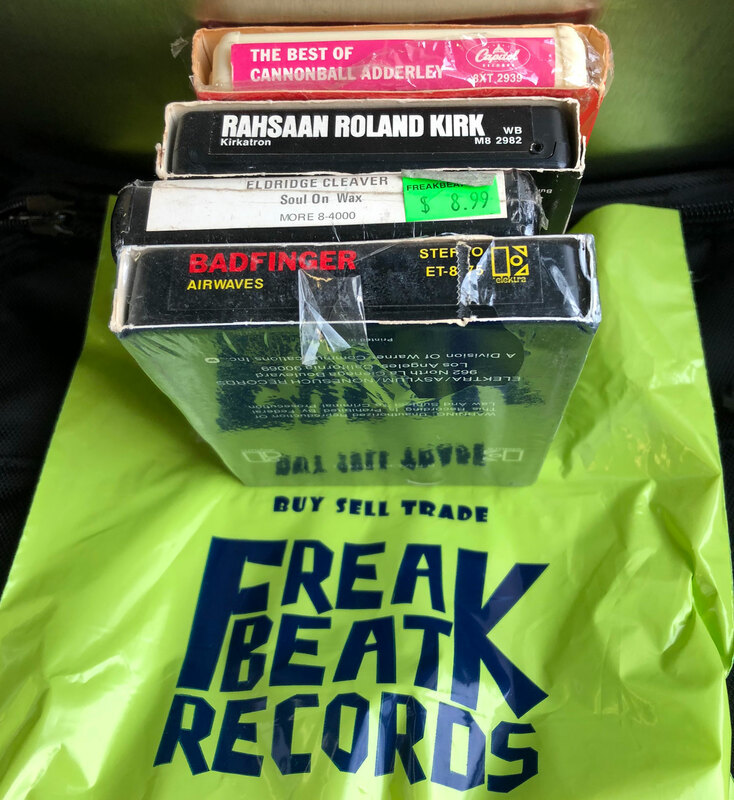 After much soul-searching, I finally picked up this spendy Ramones tape, using store credit from all the trade vinyl I’d brought with me. 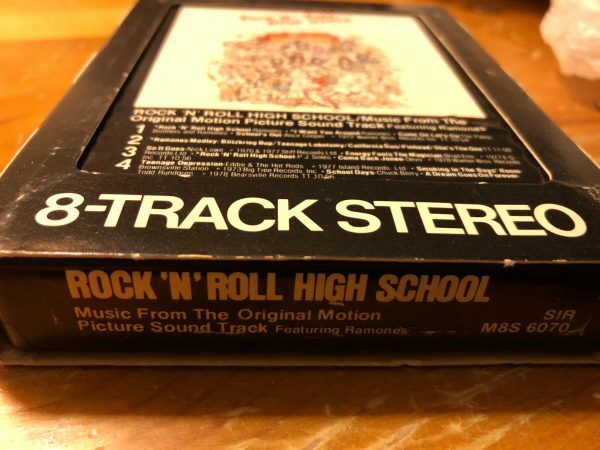 The splendid Rock ‘n’ Roll High School OST (1979) mixes Ramones cuts with other punk and hard-rock gems. 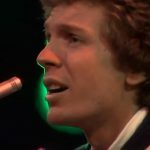 The 8-track keeps the band’s live medley intact with no breaks. Gabba gabba hey! 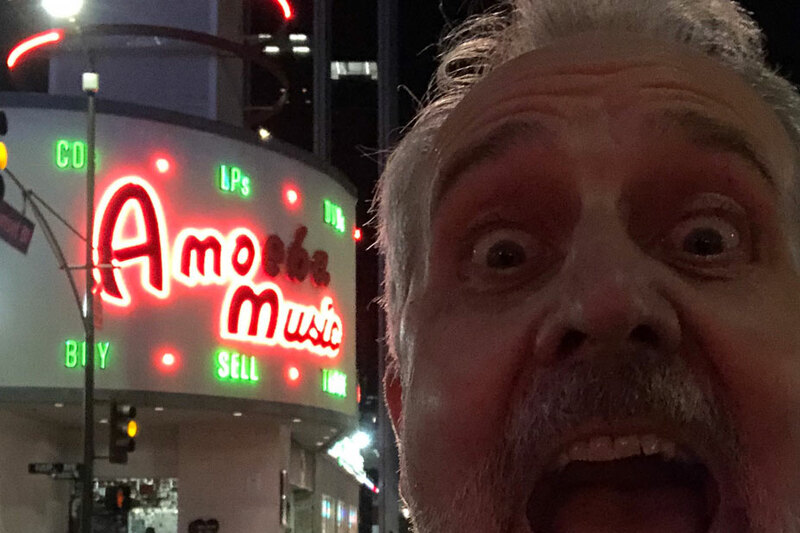 Freakbeat Records: On Friday I rode the bus to Burbank to visit buddy Steve Woolard, then took another long bus ride to Sherman Oaks and walked to Ventura Blvd. Old standby Freakbeat came through with a small stack of worthwhile tapes, including an Eldridge Cleaver 8-track (you don’t see a lot of THOSE). 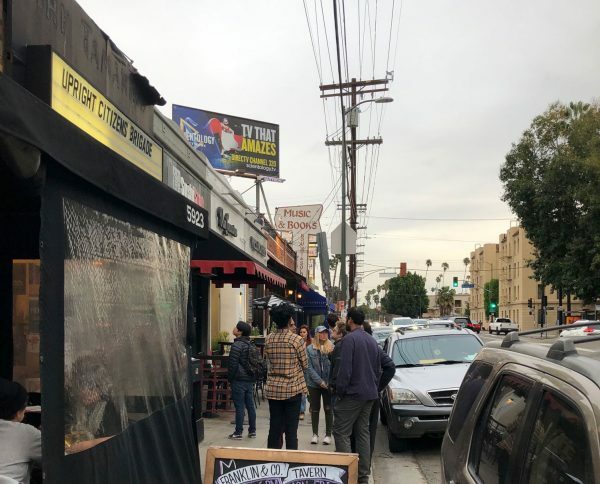 Counterpoint Records & Books: I headed back to Hollywood and this bustling block of Franklin Avenue, home to a vintage media store where I’d shopped for thirty years — but never for 8-tracks. 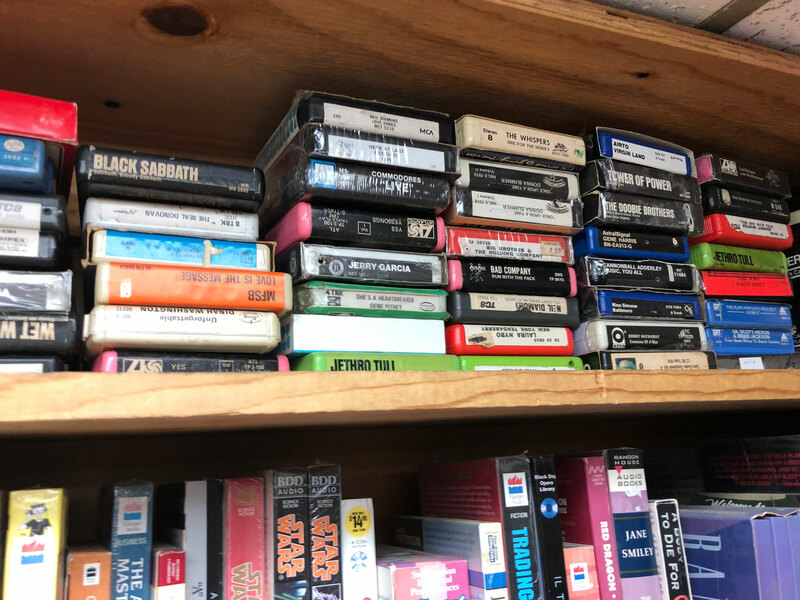 Can you see the 8-tracks hiding in that very tippy-top shelf? Not unless you’re a giraffe. 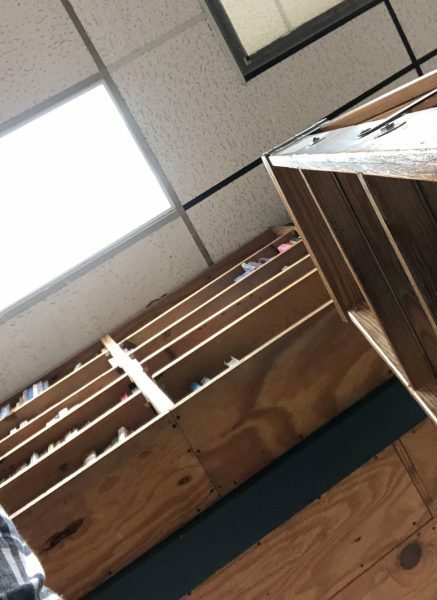 Had to use a rickety wooden stepladder to get up there, legs already wobbly from all the walking I’d done. 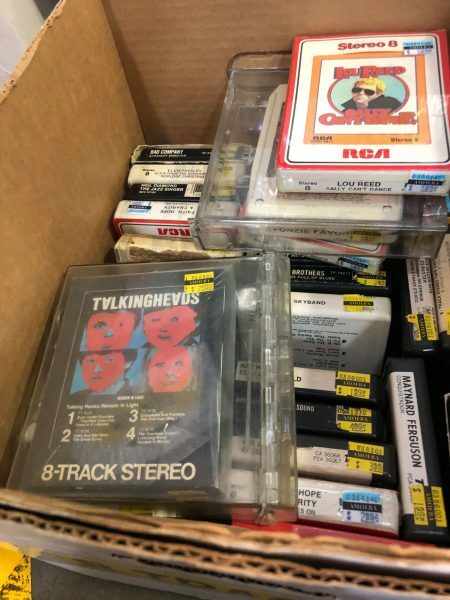 Sure enough, 8-tracks — really good ones that had been sitting there for years, according to the price tags. 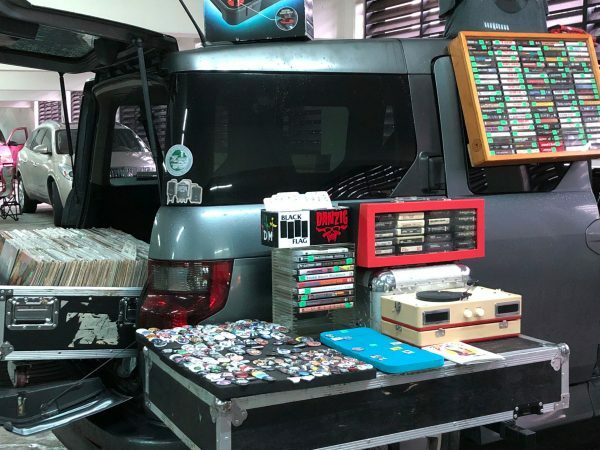 Here’s the stash I pulled down. As with elsewhere in LA, a great selection of jazz-funk, including titles on CTI and Groove Merchant. Grabbed the Troggs’ self-titled (1975) album with deranged takes on old rock and roll classics, including this weird “homage” to the Beach Boys. 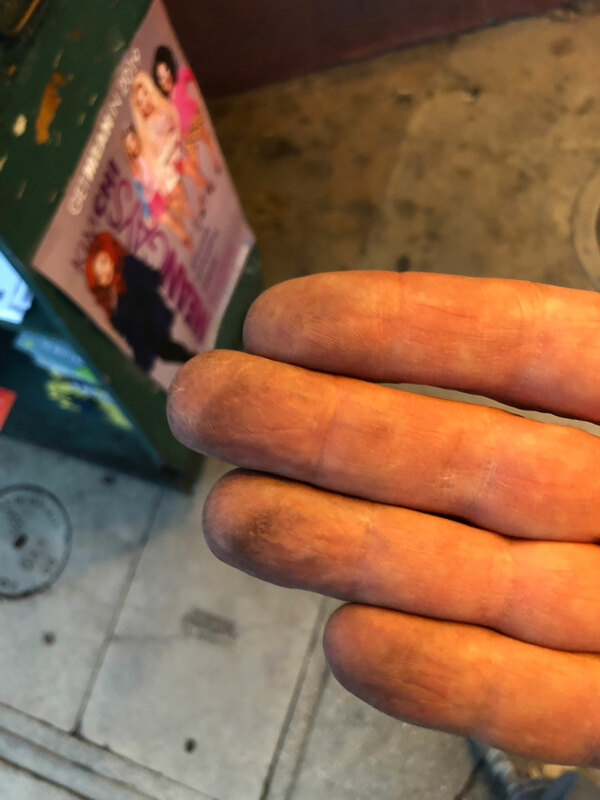 The Counterpoint dig left me with really dirty digits — gotta love those dusty, untouched gems. 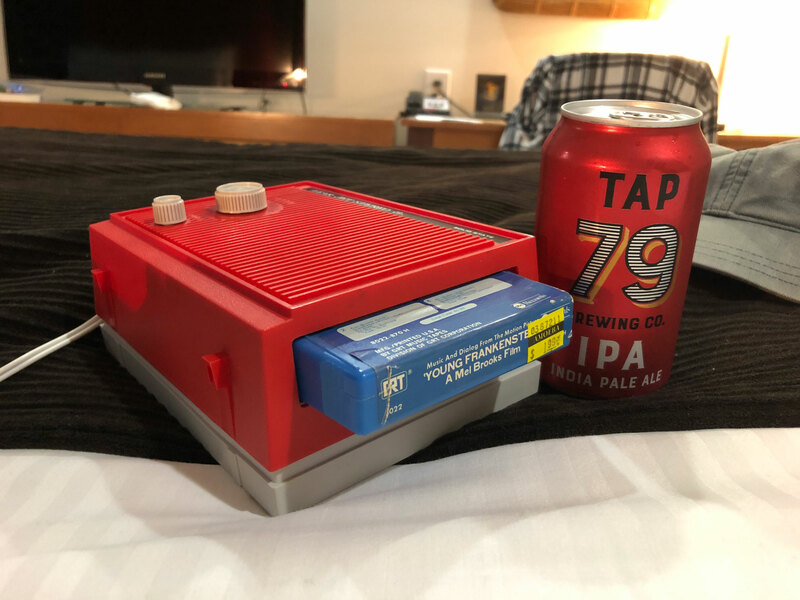 Back in the hotel room, relaxed with new old music on my LearJet Tiny 8 player and my favorite cheap IPA from Trader Joe’s. Found that the Young Frankenstein soundtrack (1974) includes more comedy dialogue than expected. But it’s all funny, and the authentic retro score is great. 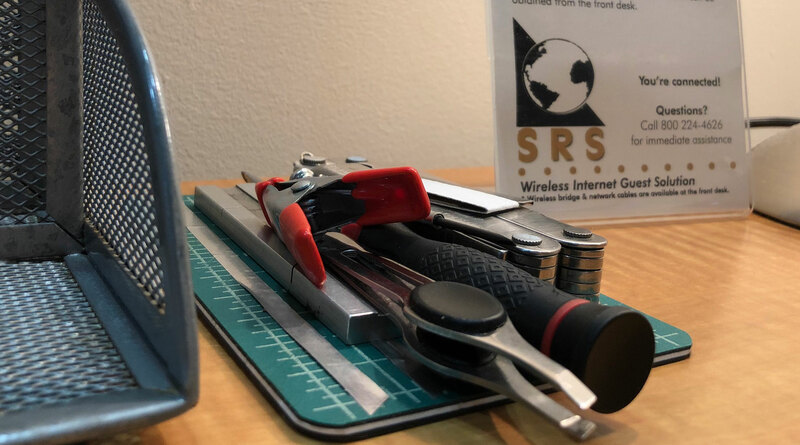 I did quite a few fixes in the room with the mini-repair kit I’d brought, so was able to enjoy a few new tapes without any splice breaks. 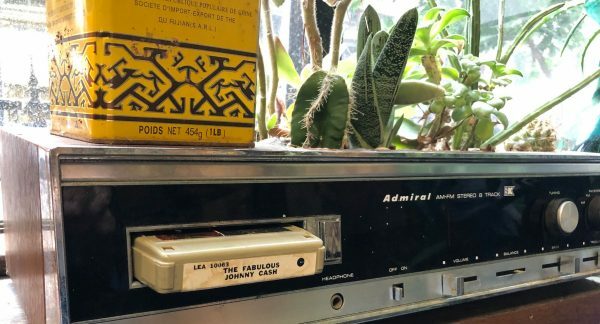 The clear 4-track cartridge adds mucho class to this 8-track flowerpot. Pasadena City College Flea Market: In years past, my pal Mark Kadlec and I made a monthly ritual of the PCC swap, so we relived our former glories this Sunday. 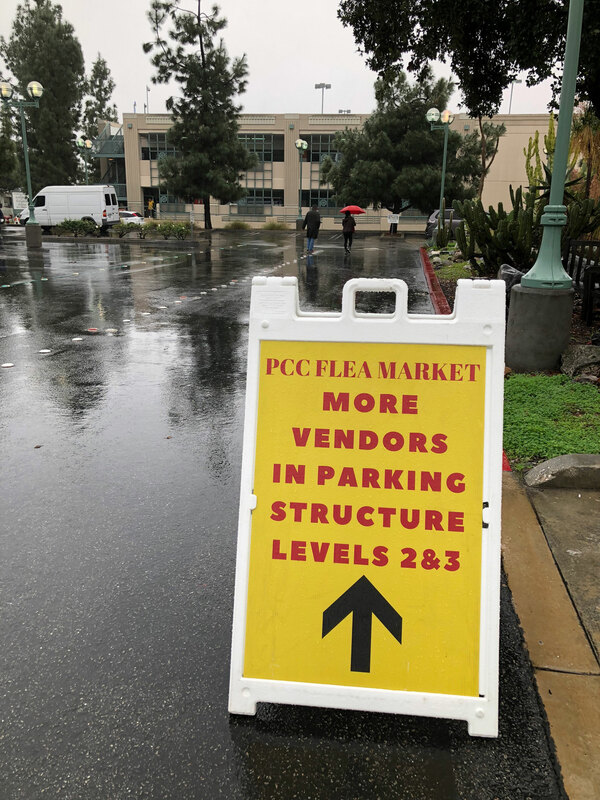 Though rain had chased away the outdoor vendors, there were plenty more inside the parking garage, including numerous sellers in the Record Show section. PCC / Zoinks Records: This tiny store in Pomona brings its goods to PCC every month, including the red box of 8-tracks seen here. I grabbed Traffic and Herbie Hancock carts for quite cheap. PCC / As The Record Turns: Kevin here runs a Hollywood Blvd. record shop and brought his 8-tracks to the swap for me. I grabbed the Shakti, Ramsey Lewis, and Archie Bell and the Drells tapes he’s holding. Natural Elements from guitarist John McLaughlin’s band Shakti mixes jazz, prog, and acoustic (think Penguin Café Orchestra or David Grisman). 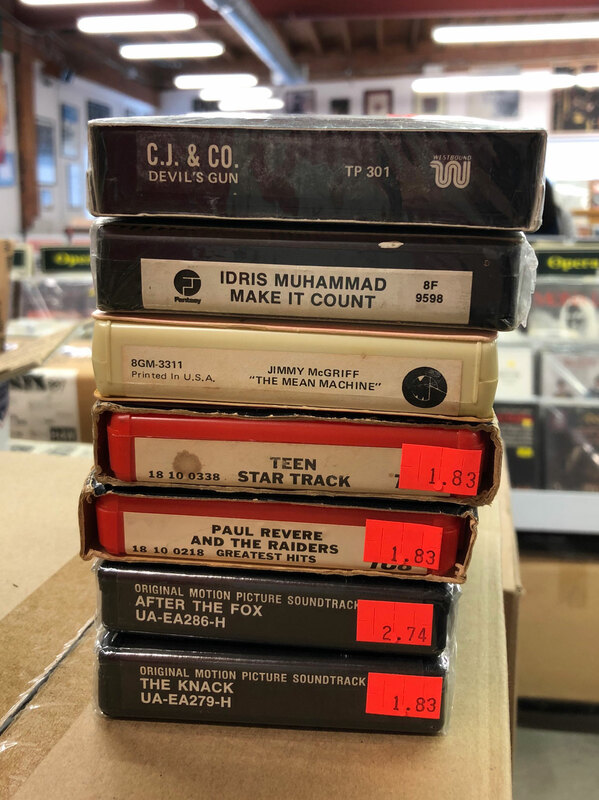 Apart from Kevin and Zoinks, these are the ONLY other 8-tracks I saw at the Pasadena swap: a miserable set of Elvis and Ed Ames tapes. 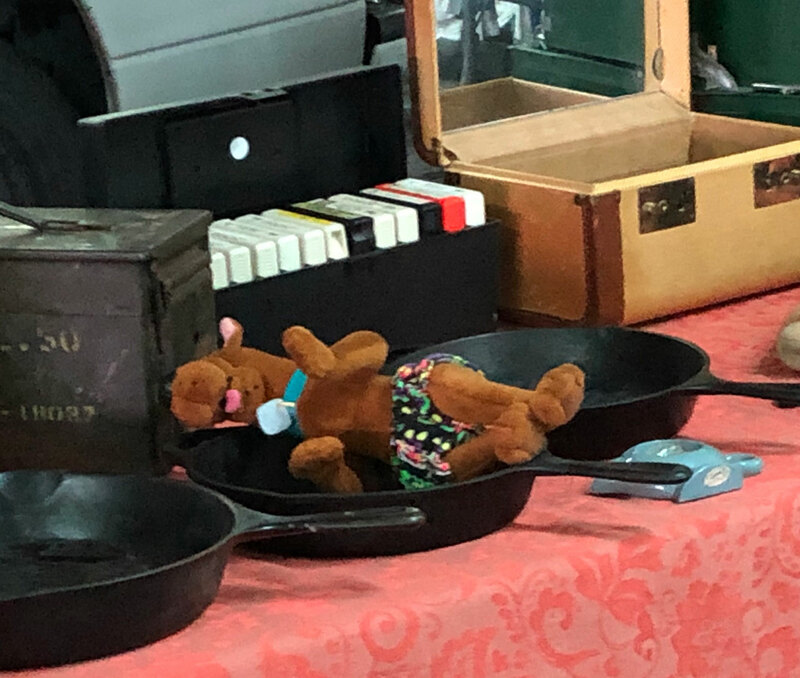 Ruh-roh! 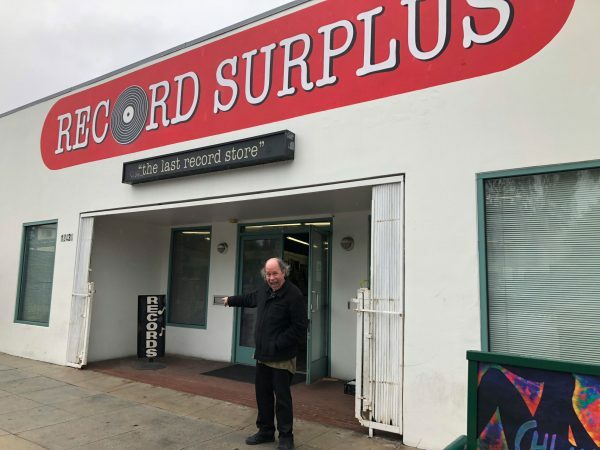 Record Surplus: After PCC, Mark kindly drove out to West LA to hit this favorite stop of ours (they sell old 78 rpm records, so he was happy). 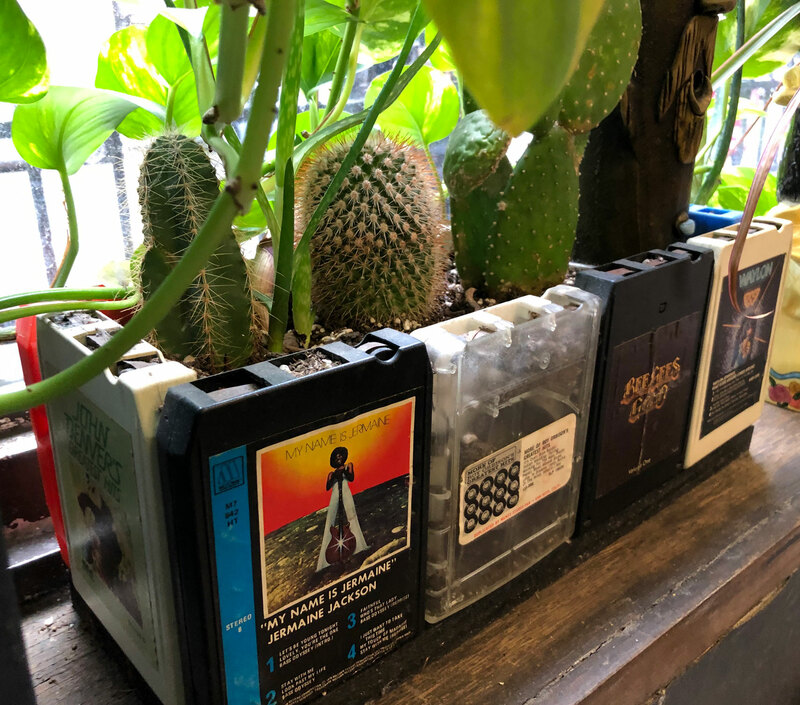 Nice to see the 8-tracks so proudly displayed next to other outdated media. Most of the black tapes were sealed United Artists soundtracks. 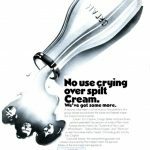 Rare stuff and good prices! Thrilled to find those lounge soundtracks from John Barry and Burt Bacharach. Organist Jimmy McGriff’s Mean Machine (1976) sounds like a lost Blaxploitation soundtrack. 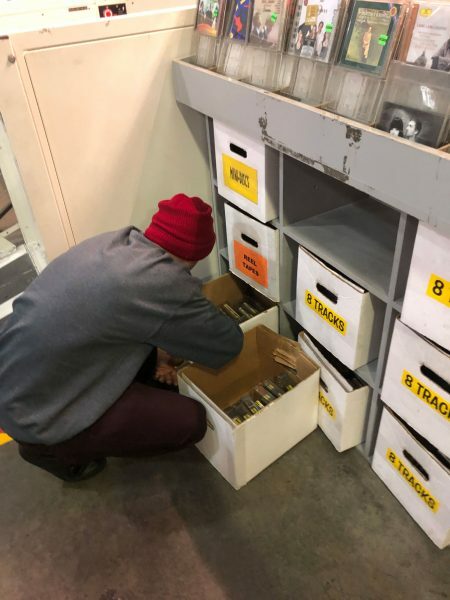 Label Groove Merchant always puts the funk into jazz-funk. 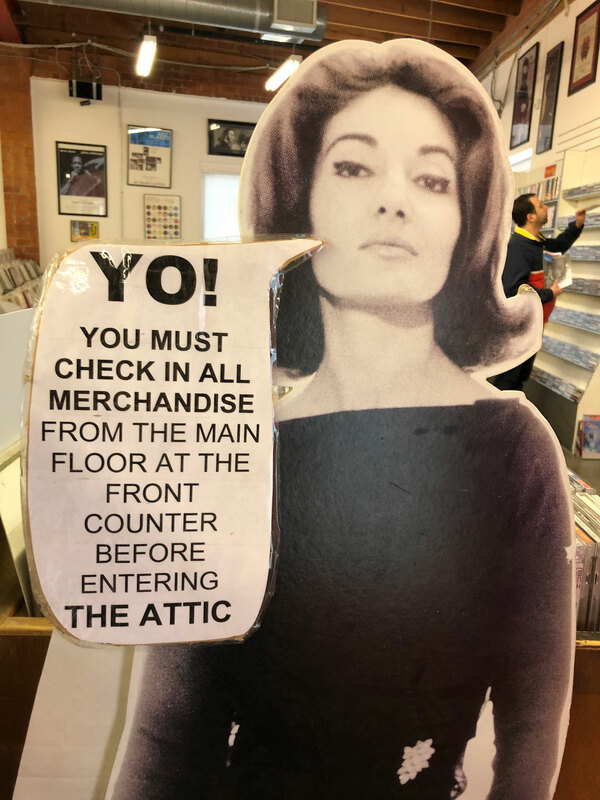 At Record Surplus’ entrance is the budget-priced “Attic,” where I found even more 8-tracks. 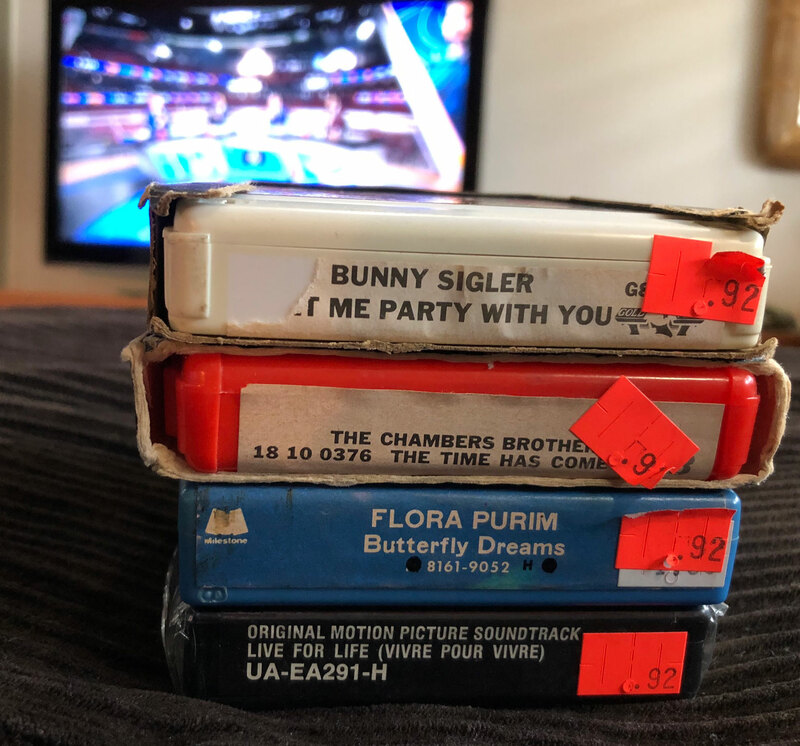 Back in the room, I checked out my cheap Attic tapes while watching the LA Rams lose miserably in the Super Bowl. Oh well, my LA 8-track game scored mightily!